Nilgiri is India’s first biosphere. It has been declared as one of the 14 hotspots of the world because of its unique bio-diversity. The Nilgiri District is basically a Horticulture district which is situated at an elevation of 900 – 2636 meters about MSL. The famous century old Ooty flower show is well known to everyone. This flower show is being conducted at this famous tourist spot of the Nilgiris – the queen of hill stations for the past 118 years. The Government Botanical Garden, Udhagamandalam was established in 1848. Its architect was William Graham Mc. Ivor who was trained in Royal botanical garden, London. The Marquis of Tweedale, the then Governor of Madras Presidency prepared the initial layout during the late 1840s. There were very few Horticulturists at that time. Seeds and saplings of exotic vegetables and fruits were not available locally for the European settlers. The garden was established from the seeds and saplings brought from all over the world. An Agri-Horti society was formed by the European settlers. The first flower show was organized in 1895 and the centenary flower show was conducted in the year 1995. This year, the 119th Flower show is being conducted in a grand manner. Almost all the flowers of the world are being showcased. Most important commercial cut flowers like Tulips from Netherlands, is exhibited. New varieties of Flowers grown by the Department of Horticulture in Government Botanical Garden, like Torenia, Calceoloria, Cyclamen are also exhibited. Floral arrangement of the Tajmahal, Elephant & Angry Bird has been showcased in the flower show which was the centre of attraction. The other floral arrangements include a Heliconia, imported cut flowers, and floral decorated gate at the inaugural point, ten Gerbera Arches were been arranged with flowers in a grand manner. 15000 flower pots were arranged in the galleries. More than 4.50 lakh flower seedlings were planted in various places of this Garden. There were 6000 different colours of potted flower plants arranged in different shapes at new garden which is the main attraction for the tourists. This Garden has around thousand species, both exotic and indigenous plants, shrubs, ferns, trees, herbal and bonsai plants. A fossilized tree trunk estimated to be 20 million years old is also found in the Garden. The Garden consists of several lawns with flowering plants, ponds with lilies, beds of flowers and ferns laid out in an Italian style, several types flowering plants, and variety of medicinal plants. 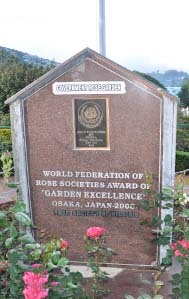 The flower show attracts about 1.50 lakhs tourists each year from all over the world. On the final day of the show, prizes were distributed to winners of various competitions held in connection with the flower show. About 185 private and public gardens participated in different categories of flower show garden competition. Several Government departments and private agencies also displayd their flower exhibits for the enjoyment of the flower lovers and tourists. More than 50 varieties of potted plants, top ten cut flowers, various kinds of tropical and temperate vegetables and fruits are exhibited by the competitors. The Floral decorations, Indian and Japanese flower arrangements, Flower Rangoli etc., are the major attractions during the show days. The exclusive cut flowers stalls from large private and public gardens were also an attraction during the show days. Cultural programmes were organized for three days to give a treat to the visiting tourists.